ATLANTA (February 15, 2017) – The Technology Association of Georgia (TAG), the state’s leading association dedicated to the promotion and economic advancement of Georgia’s technology industry, today announced IDology as one of its Top 40 Innovative Technology Companies in Georgia. TAG will recognize this prestigious group at the 2017 Georgia Technology Summit (GTS) on March 23, 2017, at the Cobb Galleria Centre. “We are delighted to be recognized by TAG for our commitment to innovation. As a leader in identity verification and fraud prevention solutions globally, we are proud to have Georgia as our home base,” said John Dancu, CEO, IDology. IDology provides real-time technology solutions that verify an individual’s identity and age for anyone conducting business in a consumer-not-present environment to help drive revenue, decrease costs, prevent fraud and meet compliance regulations. 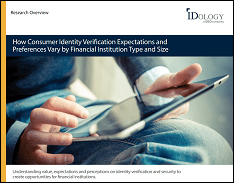 Founded in 2003, IDology offers a solution-driven approach to identity verification and fraud prevention that ultimately helps increase customer acquisition and improve customer experience. IDology has developed an innovative and on-demand technology platform that allows customers to control the entire proofing process and provides the flexibility to make configuration changes that are deployed automatically – without having to rely on internal IT resources or IDology’s customer service – so customers can stay ahead of the fraud landscape while maintaining compliance. For more information, visit www.IDology.com or call 866-520-1234.